The What: KanexPro will debut a new 2x1 USB-C and HDMI Switcher with USB 3.0 ports—the SW-2X1USBC—at Integrated Systems Europe (ISE) 2019. The What Else: Designed to auto-switch between two devices with simultaneous audio output, the SW-2X1USBC de-embeds to a balanced analog audio output perfect for ceiling speakers. 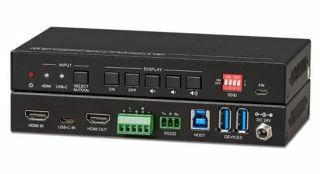 The SW-2X1USBC backs resolutions up to 4Kx2K@60Hz, 4:4:4, 8bit and 1080p/60 and supports device extension by providing one type-B USB 3.0 port for host connection to a PC and two type-A USB ports for HID devices, such as a video conferencing camera (VTC’s), microphone, or keyboard. TheSW-2X1USBC provides charging on USB-C ports up to 60W, making it an ideal companion for MacBook’s and iPads. The KanexPro SW-2X1USBC features multiple methods of control. In Auto Mode, the SW-2X1USBC will automatically switch to the first detected source device. If the active source is removed, the SW-2X1USBC will transition to the lowest numbered output. The SW-2X1USBC can be manually controlled with the intuitive from panel buttons, RS-232 command or any 3rd party control systems. The Bottom Line: With the ever-increasing need to connect USB-C based laptops, tablets and other devices for conferencing, KanexPro says it developed the SW-2X1USBC, a 2x1 USB-C and HDMI Switcher to seamlessly switch between HDMI and USB-C. It will be on display at ISE 2019 in Stand 1-N15.